Corey Potter accidentally stepped on Halls face in warm up Tuesday night after Hall slipped on a puck and slid into the corner. Hall received a significant cut from the top of his head, to the tip of his eyebrow that required 30 stitches. Hall wanted to return for the second period but was held out. Fear not, there is no chance he suffered a concussion and should be back in the next game. Chances are he wears a helmet in warm up! Benn had appendectomy surgery on Sunday and will miss a few days. He is not ruled out to play in the All-Star game in Ottawa. Wild placed Koivu on the IR list Monday with a shoulder injury. The injury occurred after a hit from Blues forward Vladimir Sobotka reports ESPN "I was ready for the hit. I was steady, kind of hitting back a little bit, and I took the hit like I always do," Koivu said. "So there's nothing I could've done differently. He just got me in the right spot." On Monday the Stars placed Ribeiro on the Injured Reserve retroactive to January 7th when he suffered a slight MCL tear. Ribeiro is not expected back until after the All-Star break. Henrique has missed the last two games with a groin strain. He is skating on his own and will participate in team practice on Wednesday. 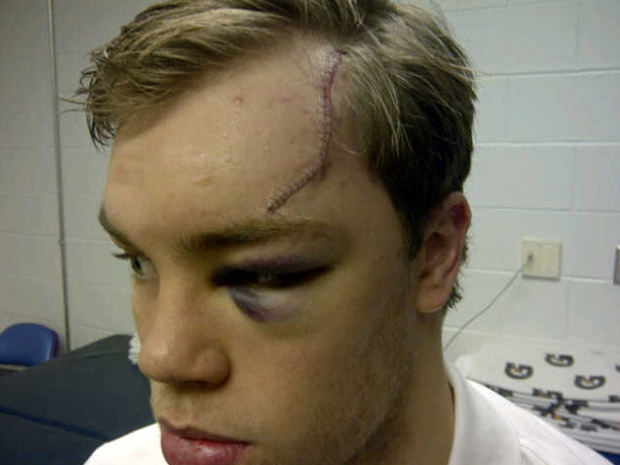 Jovo cop injured his hand on Monday night in a fight with Bruins Dan Paille. The Miami Herald reports he will not join the team on their road trip as he will see a specialist on Wednesday. Panthers coach Kevin Dineen said. “He’ll be getting an evaluation and a diagnosis and a length of treatment, so we’ll wait until Wednesday to make any statement on that.” If there is a broken bone, it may take several weeks to heal. The San Francisco Chronicle is reporting that Clowe missed Tuesday’s game as a result of a hit January 10th by Minnesota’s Justin Falk. Since the hit, Clowe has played in the last two games. That either means the symptoms are slight and the concussion is very mild, or Clowe ignored the symptoms and now may have compounded the problem forcing him out long term. The Globe and Mail reported Saturday that after taking two hits to the head in the last two games, JVR is out indefinitely with a concussion. The concussion all but killed rumors of a speculated trade involving JVR going to Toronto for Luke Schenn. Columbus placed Umberger on the IR after he sustained a concussion after taking a hit from Anaheim’s Jean-Francois Jacques on Sunday and is listed as week-to-week. Umberger’s franchise iron man streak of 288 consecutive games played is over. Skinner returned to action January 15th but took a devastating hit Tuesday night from Pittsburgh’s Brooks Orpik. Skinner left the game as per protocol, but was cleared to return. Hopefully he does not develop concussion symptoms over the next few days. Eberle returned to practice on Tuesday and is with the team on their current road trip. He is expected to be ready to return on Saturday as the Oil host the Calgary Flames for another installment of the battle of Alberta. Letang is now symptom free and was given medical clearance to return to practice on Tuesday. Letang is still day-to-day but hopes to return before the All-Star break. Activate Letang on your fantasy roster next chance you get! Bozak returned to his play between Phil Kessel and Joffrey Lupul on Toronto’s top line on Tuesday night. Booth returned January 15th from a knee injury that cost him 18 games. This has been an injury plagued season for the Sabres, here is the latest news. Robyn Regehr is day-to-day with an upper body injury. Brayden McNabb is day-to-day with a concussion. Christian Ehrhoff has returned to practice wearing a no contact jersey; he is listed as due back in about one week. Tyler Ennis had a set back in his ankle injury and has still not resumed skating. In addition to Adam Henrique out with a groin injury, centre Travis Zajac is back in the IR with an Achilles tendon injury. Jacob Josefson who was conditioning in Albany after returning from a serious clavicle injury was recalled and played on Tuesday. Blake Wheeler suffered a scary injury on Saturday as he was struck in the throat by a point shot. He was released from hospital Monday and has resumed skating, he is day-to-day. Also out still day-to-day are defense Zach Bogosian and Dustin Byfuglien with lower body injuries. Posted by pharling at 1:31 p.m.
Who if any will upset in the first round? Born Again Fantasy Gamble of the Week . . .